It’s not often that we come across binoculars that we can best describe as perfect, but the Viper binoculars have definitely made us believe that perfection is possible. If you’re looking for high-quality optics in binoculars that are lightweight, durable, and easy to use, then your search is finally over. 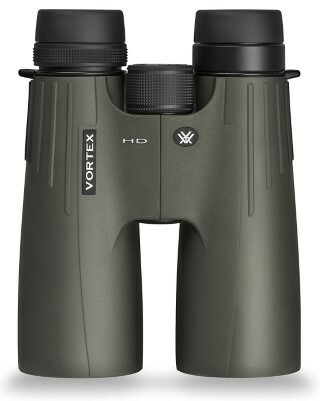 The Viper by Vortex Optics is a perfect choice whether you need to accurately sight large and small game, or you need a solid pair of binoculars for birding. These binoculars offer a dependable performance in any type of environment and feature a durable construction that will allow them to last for years. But despite the fact that they’re considered incredibly durable, they actually feature a lightweight design that also makes them perfect for hiking. Bird watchers and hunters both know that the best time to sight a rare species or prey is in low light conditions early in the morning, however, the light, or lack thereof, can make it difficult to sight a target. But the Viper HD binoculars can handle a wide variety of light conditions like a champ. This model comes with lenses that are multi-coated in order to improve light transmission, so you won’t have to worry about missing out on sighting that rare bird or a huge buck off in the distance, ever again. The Binoculars are equipped with O-rings that securely fit around the lenses in order to prevent debris, dust, and dirt from getting inside. They also work to keep moisture out, allowing you to see clearly. These binoculars are argon gas treated, which also prevents fog and water from clouding the lenses and compromising lens integrity. With O-rings that are tightly sealed, these waterproof binoculars can even tag along on your next fishing trip. In terms of image clarity, these binoculars offer a stellar performance. Now, you’ll be able to capture every detail, from leaves on distant branches or markings on feathers. The glass is high-density and designed for low dispersion, which is what makes these binoculars perfect for dim light use. Because it doesn’t disperse the available light, images will always be clearly defined and brighter. With these high-definition binoculars, there’s really no limit to what you’ll be able to see. Regardless of how careful you are, or how durable the binoculars are, damage can occur. 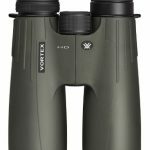 Vortex Optics has backed these binoculars with a lifetime warranty, which covers all parts, including the O-rings and lenses. The binocular’s durable construction will ensure that they’re able to withstand any type of environment ranging from foggy cold mornings to twilight fishing on the water. Like most models of higher priced binoculars, the Viper is covered in a heavy-duty rubber armor. The binoculars have a nice heft to them and are well-balanced and comfortable to hold. The thumb indents located on the underside of the barrels are a nice touch. The eyecups feature a soft, thin rubber coating that provides a more comfortable user experience. The long eye relief of twenty millimeters provides more than enough space for eyeglass wearers. If you don’t know how to focus binoculars, then the easy to use focus wheel on the Viper will be a welcome surprise. The focus wheel has been etched for improved grip and has a hard rubber coating to improve durability. Turning the wheel feels smooth, requiring one and a half turns to go from infinity to a distance of five feet. The Viper’s locking diopter adjustment ring is made out of a type of hard rubber and has also been etched for improved grip. This feature is located near the right eyecup. The diopter is lockable, so in order to adjust the setting you must pull it out before twisting. This will prevent the focus wheel from moving when the binoculars are in your pocket or during transport. The markings on the diopter ring will tell you where the middle point is. The high-density glass provides a crystal-clear viewing experience. Chromatic aberration isn’t even an issue because the glass is able to concentrate and direct the wavelength of light effectively onto the eyes. Equipped with phase correcting coating, this type of coating will keep the light in correct color phases and will produce an image with a higher resolution and better color contrast which results in enhanced color reproduction. These lenses are fully multi-coated. This means that every air to glass surface has received multiple coating layers of anti-reflective coating, providing increased light transmission. The exterior lenses feature a tough scratch-resistant coating that will protect the lenses from dirt, oil, and scratches. These binoculars use BAK 4 roof prisms. The Viper offers a great balance between field of five and magnification. The size, light gathering potential and forty-two-millimeter objective lenses with 8x magnification make these binoculars a great choice for most birders. The large field of view is what really matters when you’re birding because it allows you to locate small, erratic birds, quickly. The forty-two-millimeter objective lenses are large enough to allow plenty of light in, but not so big that they make the binoculars difficult to hold or carry. Combined, these qualities make the Viper the perfect choice for sighting wildlife. The best compact binoculars on the market, the Viper HD binoculars by Vortex Optics offers the type of impressive image clarity and top of the line viewing performance that birders and hunters are looking for. The first time you take them out for a test spin you’ll instantly notice how well they perform compared to lower-priced models, even on an overcast day. Lightweight, pocket friendly, and easy to use, these are binoculars that have it all. We gave this model a rating of five out of five stars. OutdoorSpike.com is a participant in the Amazon Services LLC Associates Program, an affiliate advertising program designed to provide a means for sites to earn advertising fees by advertising and linking to Amazon.com. Additionally, OutdoorSpike.com participates in various other affiliate programs, and we sometimes get a commission through purchases made through our links.